The tour will run from April 3rd to April 12th, 2015 and consist of four schools in three eastern states. Jarvis will serve as the lead instructor for the entirety of the tour. Rock Camp, WV - Mt. Motorcycles just announced that it has partnered with Poisk Adventures to produce a rare and exciting instructional event in the Eastern United States. The Hard Enduro Techniques Tour with Graham Jarvis is designed to assist off-road motorcyclists who wish to improve their technical skills and knowledge with respect to riding in difficult terrain. Students on The Tour will receive world-class instruction, and a rare opportunity to ride with the current Red Bull Hard Enduro Champion. 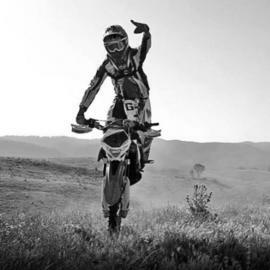 Graham is a Husqvarna factory rider, and is arguably the most skilled technical rider in the world. Trials Training Center (Sequatchie, TN), home of The Kenda Tennessee Knock Out, will host schools one and two. School three will be held at Brushy Mountain Motorsports Park (Taylorsville, NC). The tour will conclude with school four at Mt. Motorcycles (Rock Camp, WV), where the event was first held in October of 2014. This round will be held in conjunction with a grand opening ride at that venue. A motorcycle destination resort and camp in the mountains of Southeastern West Virginia. Mt. Moto is operated by Off-Road Resource Management, LLC, and is scheduled to open in April of 2015. The facility is designed for motorcyclists only, and welcomes riders of enduro, dual sport, adventure, trials, and street disciplines. "A mountain of opportunity for motorcyclists." Pre-register for a school with Graham Jarvis!